Voting for positions on the Standing Committee, Disciplinary Board and University of the South Trustee was completed after a nominating ballot and a single electing ballot. Those elected are as follows. The Standing Committee met immediately following Convention and elected The Rev. Carlye Hughes as President. The Disciplinary Board met immediately following Convention and elected The Rev. Henry Penner as President. Mr. Gilman Tracy, Chair of the Nominations Committee, presented the committee’s report, including all nominees for elected positions. Bishop Mayer thanked everyone who had put their name forward to stand for election. The bishop announced his appointments, and the Convention voted to approve his nominations. View a list of the bishop’s nominations and appointments. Line 51705 (Cursillo) of the 2016 budget was reduced by $963 from $5,000 to $4,037 in order that the budget would balance. The resolutions committee also presented a resolution in response to Bishop Mayer’s address and several courtesy resolutions that will be posted soon. Here is a shared folder where you can view and print individual reports in PDF format. Click the link to open the folder. Photos from Friday at Convention are in this Facebook photo album. The video below, titled “The Arms of God,” introduced Bishop Mayer’s address to Convention on Saturday, giving a brief history of the Episcopal Diocese of Fort Worth up to the present day. Read about Bishop Mayer’s address to the Convention on Saturday; you can also download the full text of his address. As Bishop Mayer noted in his letter to the diocese, the offering at the opening Eucharist ($941.72) will be directed to Episcopal Relief and Development toward their work responding to the refugee crisis from Syria. 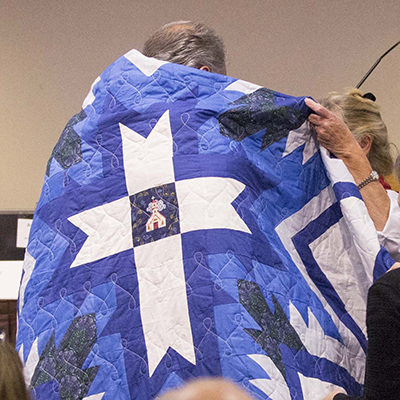 Proceeds from the quilt raffle ($886) will go to help Native American youth in South Dakota. 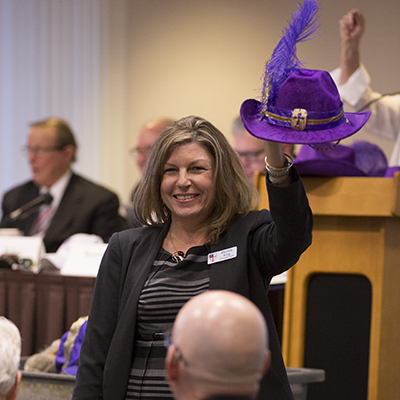 The auction of costume items from the skit ($1,420) will be split between the propane fund for the reservations in South Dakota and Episcopal Relief & Development’s work with Syrian refugees. The report of the Mission and Outreach Committee detailed work that diocesan grant funding will support this year, both within and outside of the communities in our diocese. Watch this video and read more about this year’s grants. There was very good attendance – 28 people – for the third module in the Safeguarding series andthat was offered as a pre-convention educational opportunity for clergy and church leaders. It is required for all clergy and vestry members and has not been available in the Diocese of Fort Worth for quite some time. It was be taught by The Rev. Nancy Igo, Director of Communication and Human Resources in the Diocese of Northwest Texas. Evangelism is not primarily about building up the institutional church but rather about leading people to a life transformed by the Good News of Jesus Christ. Evangelism is an essential practice for every Christian. We live in a world that is desperate for a word of hope. But what does that look like in a multicultural age? How do we practice evangelism that invites, not condemns? Scott Gunn will talk about how congregations can reinvigorate their practice of evangelism, both with their online presence and in their encounters with guests. He also will share some examples of personal evangelism. The Reverend Canon Scott Gunn is executive director of Forward Movement, a ministry of The Episcopal Church with a mission to inspire disciples and empower evangelists. In addition to its flagship publication, Forward Day by Day, Forward Movement offers print, digital, and online resources promoting discipleship and evangelism among congregations and individuals. Scott has served as a parish priest and as a technology executive. Online learning has forever changed the way businesses and universities operate. It’s also changing the way churches shape disciples. Thanks to the golden tripos of convenience, affordability, and expert teaching, online learning is becoming an emerging and viable option for ongoing discipleship training. In this workshop The Rev. Chris Yaw, founder of ChurchNext, shows us how and why online resources are working to help parishes shape disciples. The individuals, churches, and institutions of The Episcopal Church represent an abundance of gifts. The Episcopal Asset Map is meant to connect people – both within the Church and in the broader community – to these gifts and thereby promote the sharing of ideas and information. Already, two more congregations have completed surveys to add more information to the map! The Refugee Services of Texas Fort Worth office was founded in 1996 and is affiliated with Church World Service and Lutheran Immigration and Refugee Service, which is the partner organization, in this area, to Episcopal Migration Ministries. Since its inception, RST Fort Worth has provided resettlement services to more than 2,500 refugees, asylees, and other displaced persons. RST Fort Worth offers programs to assist refugees with basic needs and services during their initial resettlement to the U.S. Refugee clients are also provided with case management and financial assistance while they work to meet the challenges of transitioning to the local community.